I don’t know about you guys, but in this house we are pickle fiends. Sammiches? Incomplete without the crunch. Burgers? We pile ‘em on. Antipasti, un-tuna, and ‘tater salad are all just vehicles to get at the soured goodness. I love the different dishes, but mostly I devour the suckers straight up. Damian, as a child, was known to drink the brine right out of the jar!! (!!!) Waits hasn’t tried them yet, but I’m sure he’ll join Team Pickle, too. The good news is, pickles are easy to culture and when you make them this way (as opposed to vinegar pickles), you get all the awesome power of probiotics. The even better news is that in most places in the northern hemisphere, the special, small-sized cukes are still in season. So get on it! Prep your ingredients. Gently wash your cukes but be careful not to bruise them. Thoroughly wash your jars. Prep the salt water and garlic. 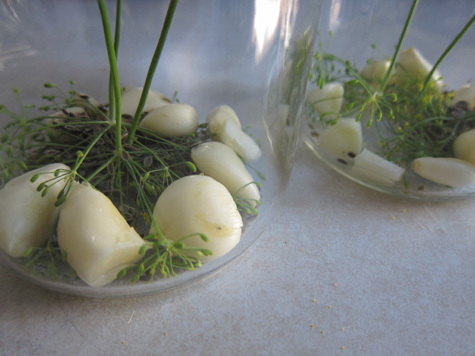 Place the dill flowers face down in the jar. Add the garlic and the dill seeds. Add the leaves. This is very important, so don’t skip these! They are rich in tannins and will keep your pickles perky. Nobody likes a mushy pickle! 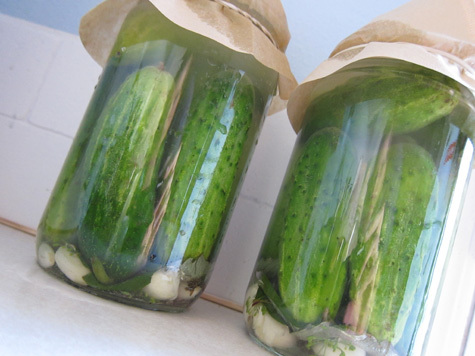 Leave your pickles in a warm spot to ferment. Check the liquid levels daily and add more brine if needed. They’re ready after a week or so, but you can continue fermenting ‘to taste’. But seriously, check the liquid levels every day . . .
Don’t allow your babies to be compromised by exposure! Air = bad, brine = good! As always, more awesome information is available at Wild Fermentation. Happy pickling my dears! Excited to try these (and to be the first commenter today! )…although I must admit I am quite a vinegar nut…pickles sans vinegar..hmmm…we’ll see : ) A great experiment indeed. This would be a cool project to tackle. Now if I only knew where to get strawberry leaves in the desert. So wishing you had posted this before I jarred a zillion batches of pickles the traditional way when it was 100+ degrees outside! Luckily, my daughter and I are pickle fiends, so we’ll need a new supply shortly. Does this work with hot peppers? Oh yum. I’m one of those people that will eat anything as long as it’s pickled. I tend to go overboard though and usually need a gallon of water afterward. Totally worth it. @ Rebecca – I’m a vinegar nut too! But ferments have that nice tangy bite as well. Very nommable! @ windycityvegan – I’m sure this would work with most any veggie. Peppers would be deeeeelicious! @ Cedar – Haha I’m so guilty of that too! I made so many of these this summer it was ridiculous. I LOVE pickles. 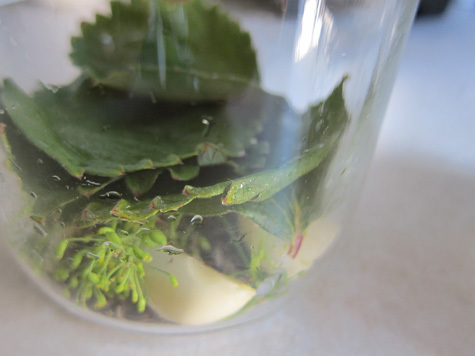 You can use sour cherry leaves as well FYI (I have a tree out front) and for non-vegans a few tablespoons of (homemade) whey will help the lacto-fermentation process (I only fermented quart jars for 3 days I think, although my best batch was two or three weeks in a crockpot). Cucumbers specifically grown for pickling, picked small and left whole (I slice thin sections off the ends) are the best crunch-wise. And if you want to can them afterwards you can boil the brine, add more salt and can as usual. Seems like a waste because you’re killing the culture but honestly I think my best canned batch of pickles began as fermented pickles. Wow! 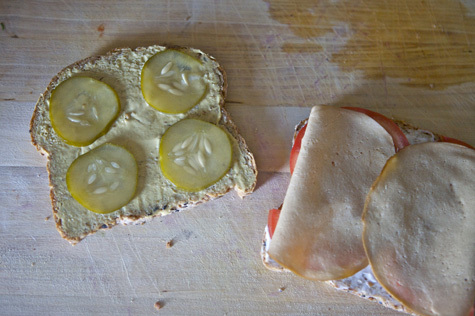 Those pickles look soooooooooo good! And they are BEAUTIFUL too! @ sarah – Great tips! Also veg*ns can use whey from homemade yogurt – I’ve done that with other veggie ferments and it works great! @ Sarah – Yups, that’s mold. Very sad. Love love love this! Totally going to try it soon! Thank you! Also! In the first picture your pickles are slices! Do you slice them after pickling, or do you do the same thing with slices rather than whole cukes? 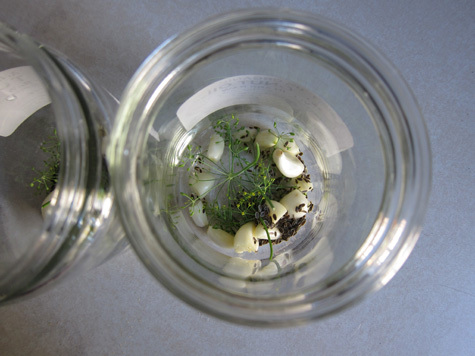 @ Meghan – I did grow my own dill! 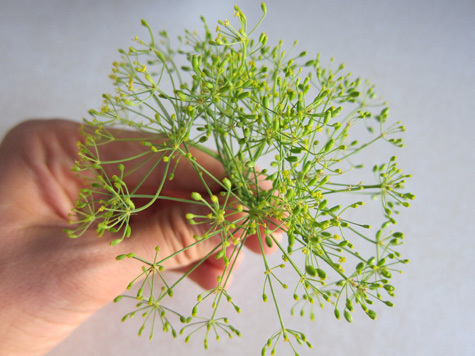 That’s a good point, securing dill flowers may be a bit tough. Farmer’s Market is a great idea, maybe you could ask a farmer one week to bring you some flowers the next week? I’ve done stuff like that and they’re usually super friendly about it. Otherwise, it’s not *totally* necessary especially if you have the dried dill seeds. The sliced pickles were a different batch, and I did pickle them in slices. I prefer the whole pickles because you can always slice them afterwards, but either way works. So, I finally got around to making a jar of pickles (I did spears!). The cukes themselves seem totally fine, but there is a layer of mold on top of the brine (probably from the dill seeds poking their little heads above it?) I know that the Wild Fermentation website says to just scrape the mold off. I am sort of inclined to do so, then put the pickles in a new bottle with new brine for “storage,” but I’m kind of unclear as to how to sufficiently remove the mold so that when I pull the pickles out they don’t pick up creepy spores on their way? Does that make any sense? I’m hesitant to throw the whole thing out, ’cause, like I said, there doesn’t seem to be any mold on the actual pickles. 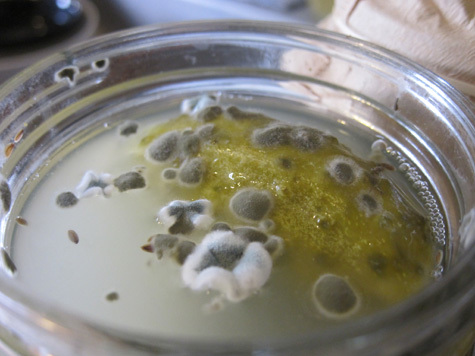 But mold is mold and mold is gross. I’m conflicted. :-) Any thoughts? Also, the mold doesn’t look like your mold… it is a kind of scuzz that covers the top of the brine. At first it was just a scuzz that looked scuzzy, but now it is is a scuzz that looks moldy. It was probably originally scuzz, and then the scuzz was exposed to air so it got moldy. Pros say to skim it off the top and you’re good to go. Honestly, Damian is too squeemish for that (he has a phobia of throwing up, so he’s real paranoid about food safety) so I haven’t done it myself. BUT, theoretically as long as the pickles are submerged then they’re safe, right? So what if you kept them in the same jar, in the fridge, and then whenever you pulled a pickle out you could rinse it off JUST IN CASE there were any spores remaining on the surface. Yes? Just wanted to say that I just made my third round of pickled green beans today using this recipe and they are SO GOOD!!! I have also made the recipe using cucumbers and they are awesome too but green beans…totally my favorite.